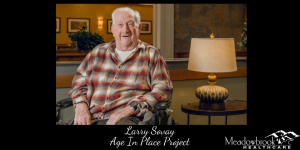 We are pleased to reveal Meadowbrook Healthcare’s Age-in-Place (AIP) Project; this project is intended to highlight the benefit of aging in place, but also to honor individuals who have lived a full life and to share their stories. 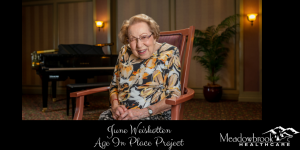 Several weeks ago, Community Relations Coordinator, Sandy Geddes sat down with four of Meadowbrook’s residents and asked them to share with her their life stories. The interview notes were developed into stories and will be accompanied by professional photographs of each of the residents. At Meadowbrook, when individuals come to live here they are able to go through the aging process with the same people caring for them over the course of the years. This enables our staff to know and care for our residents as they age. It can also help them during this final stage of their life by always knowing who they are or where they have been, even if they forget. 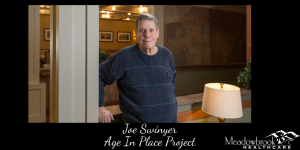 “Every life is important and should be recorded” said Joe Swinyer, resident and participant in AIP Project. 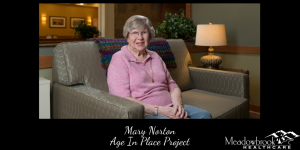 In addition to Mr. Swinyer, the three other residents profiled are June Weiskotten, Mary Norton and Larry Sovay also participated in the launching of the project. “As we get older, the importance of knowing you will be cared for is important,” said Meadowbrook’s Administrator/CEO, “but knowing that your true essence will not be forgotten is as important. We are able to do that here; the residents are part of our family.”Please visit our website, https://meadowbrookhealth.com/features/age-in-place; we will share one story each week. The stories and accompanying photographs will be on Meadowbrook’s website, and shared on Facebook, Instagram, Twitter and LinkedIn.